Fourth Row Center: Film Writings by Jason Bailey: On DVD: "I Knew It Was You: Rediscovering John Cazale"
On DVD: "I Knew It Was You: Rediscovering John Cazale"
John Cazale appeared in exactly five motion pictures before he died of cancer at 42. But the five films he made were among the best films of Hollywood’s richest decade. If you could only appear in five movies, you could do a lot worse than The Godfather, The Godfather Part II, The Conversation, Dog Day Afternoon, and The Deer Hunter. His entire filmography was nominated for the Academy Award. 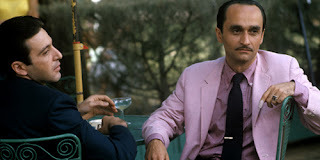 The documentary is directed by Richard Shepard (who wrote and directed the wonderful 2005 film The Matador and the not-quite-so-wonderful 2007 picture The Hunting Party), who manages to structure the film in a way that mirrors Cazale’s life: it burns bright, briefly, and then it’s over far too soon. Shepard uses inventive on-screen text and photos to fill in the biographical information (shades of The Kid Stays in the Picture), but mostly draws on analysis from actors and filmmakers, as well extensive clips from those five great films—allowing, in a sense, the work to speak for itself. The joy of the film comes from the joy that these friends, collaborators, and admirers glean from his work. When Lumet describes Cazale’s greatness in the scene in The Godfather where Michael arrives in Vegas and dismisses Fredo’s impromptu party, or when Dreyfuss describes how Cazale plays the aftershock of Don Vito’s shooting, their passion and respect for the work is palpable. When several of the actors pinpoint tiny, peripheral moments in his Deer Hunter performance (“He does this thing…” they all begin), they all convey a sense of possibilities being opened up, of truly understanding the full breadth of great acting. Shepard’s film is imperfect; he stumbles badly at the beginning by falling back on that old warhorse, the “man on the street” interviews (there are savvier ways of putting across that most people don’t know who Cazale is than standing out on a street with a photo and saying “Hey, do you know who this guy is?”), and the fact that Rush Hour hack Bret Ratner co-produces the film (and bully to him for that) is no excuse for him to be interviewed when no other contemporary directors are (and, for that matter, neither is Deer Hunter director Michael Cimino, though he’s notoriously hard to get on-camera). But for most of its brief running time, the film is energetic and impassioned, with the kick of similar docs of the era like A Decade Under the Influence and Z Channel, and when his illness is revealed, it comes from as far out of nowhere in the film as it must have in his life. There’s a quick turn into genuine emotion, most of it carried by Streep (she’s candid, warm, and entirely sympathetic) and Cazale’s brother Steve, as well as his many friends and admirers. That it makes that turn, and makes the actor’s loss so poignant, is a real accomplishment. This is a sad, moving, beautiful little film. “I think I learned more about acting from John than anybody,” Al Pacino says, in I Knew It Was You: Rediscovering John Cazale. “He made you better.” This is perhaps the most valuable thesis of Richard Shepard’s documentary, which seeks to give this too-often-forgotten actor the spotlight he so richly deserves. For film fans, it’s a must-see. 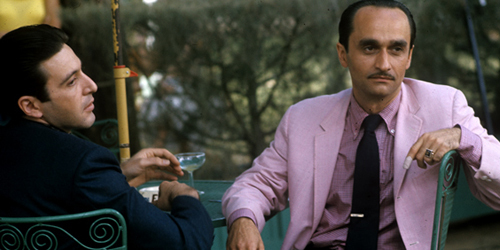 "I Knew It Was You: Rediscovering John Cazale" was released today on DVD. New on Blu: "Sherlock Jr./Three Ages"
On DVD: "Scott Pilgrim vs. the World"
On DVD: "You Don't Know Jack"